Happy Saturday! I hope you are doing well. I am always busy crafting something. I have come to accept that simple fact. Now, don't get me wrong. I am not complaining! I actually love the whole experience of creating something. Anything. Party favors. Cards. Journals. Calendars. Whatever. Just getting the time to sit, and craft is a pure joy! Now, before you start analyzing my card. Let me first say, that I did NOT come up with this idea. I actually saw a card on Pinterest here, and basically copied it. I did change the colors slightly, and the sentiment, but short of that I didn't have the original idea. Oh, and everything I used, is current from Stampin' Up! 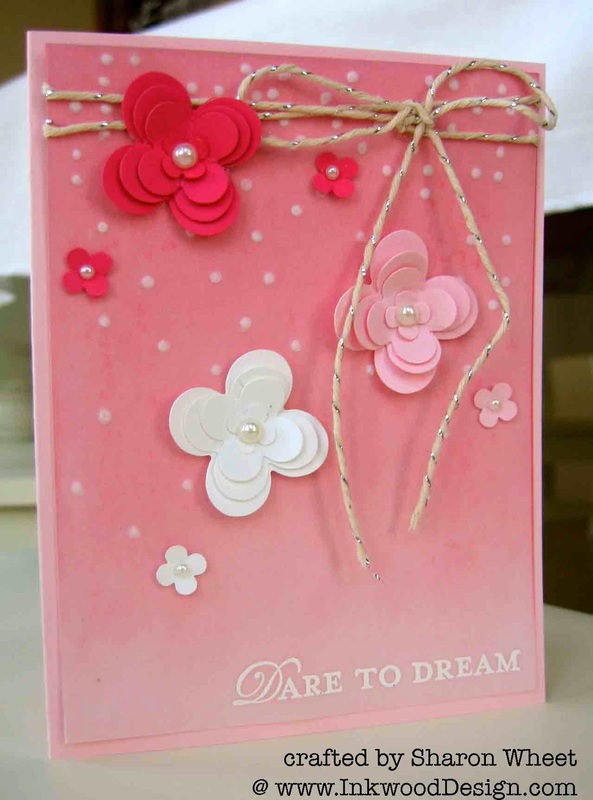 Here is the card recipe: The card base and front panel are Pink Pirouette card stock. I used two pink inks to create the ombre coloring: Strawberry Slush, and Blushing Bride classic inks. I used a sponge to color the pink pirouette card stock. I started with the darkest pink at the top of the main panel piece, and then added blushing bride ink to the sponge as I went down the main panel piece. So that at the bottom of the main panel piece, there is no added ink. To create the random dots, I used a stylus and the polka dot embossing folder as my guide. Simply open your embossing folder, and place your vellum on the side that has the indentations, and use the stylus to color-in the polka dot. Do this randomly. (the deeper you press your stylus into the vellum, the whiter the polka dot.) I used the Stampin' Up! glue stick, and applied glue to the back side of the vellum, and adhered it to the front of the main panel. For the sentiment, I just stamped the words in Versa Mark ink, and dusted white embossing powder over the ink. Tapped off the excess powder, and used my heat tool to set the embossing powder. I used a long piece of the new Silver Baker's Twine and wrapped it around the top of the main panel and tied a large bow. To create the blossoms, I used the four petal blossom from the Itty Bitty Shapes Punch Pack, and the Floral Fusion Sizzlits. I used whisper white, pink pirouette, and strawberry slush card stocks. I then simply stacked the pieces and fluffed the petals. I added a pearl to the center of each blossom, to repeat the polka dot pattern. I adhered the blossoms in 'empty' spaces, so I wouldn't cover-up any of the polka dots. This is a simple card, but I think it's really pretty! I imagine that it would look equally stunning in blues, or greens, or even a grey/black combo! Well, thank you for looking, and stopping by. I'll post the cards we make in todays class tomorrow. So stay tuned! Also, I am hosting another card making class next month, on how to use up some of those scrap pieces of pattern paper that you just can't let go of. Tickets for this event are not available yet. But, as soon as they are, I will post a link and some photos of those cards.